Leaders for Hidalgo County EMS/South Texas Air Med met on Jan. 31 to work to finalize a plan to provide helicopter air ambulance service to area hospitals. 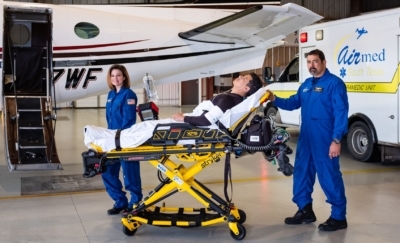 The announcement came shortly after Air Evac Lifeteam in McAllen immediately ceased operations. Bringing helicopter air ambulance service back to Hidalgo County also will help Gov. Greg Abbott and Valley state lawmakers in Austin to secure state funds needed to pay for the establishment of Level I Comprehensive Trauma Center(s) in the Valley. During the ongoing 140-day 86th Texas Legislature, which began Jan. 8, Abbott and Valley state lawmakers in Austin are looking for ways to provide funding for the creation of additional Level I Comprehensive Trauma Centers throughout the state – including in deep South Texas. The Valley state legislative delegation, supported by Abbott, is seeking state funds to upgrade at least one, if not more, of the numerous area hospital trauma centers to Level I Comprehensive Trauma Center. Abbott, in a letter addressed earlier this fall to the Rio Grande Valley state legislative delegation, has promised to use his powerful influence in the Texas Legislature and elsewhere to help secure state money to establish at least one Level I Comprehensive Trauma Center for South Texans. The governor’s support was prompted by a letter signed by the area’s state legislative delegation in mid-September 2018, and presented to Abbott by Rep. Terry Canales, D-Edinburg, where South Texas legislators urged Abbott to help secure state money for a Level I Comprehensive Trauma Center(s) in the Rio Grande Valley, and for improved statewide trauma preparedness.